Look around and what do you see? A beautiful world, that is made of living and non-living things! Let's introduce our little scientists of kindergarten, grade 1 and grade 2 to this world with our living and non-living things worksheets. Learn the characteristic traits that help distinguish living and non-living things, find aesthetically designed charts, exercises to test comprehension, cut and paste and many more fun activities. Boost attention span and curiosity of your little ones with visually appealing living and non-living thing chart. 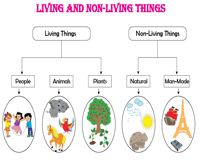 Differentiate between living and non-living things with this classification chart. 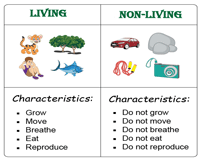 Grab the attention of the little ones with this characteristic of living and non-living things chart. Acquire knowledge of the basic attributes that help distinguish living things from non-living things. Observe and identify the pictures and pose questions like - Does it breathe? Does it grow or move? 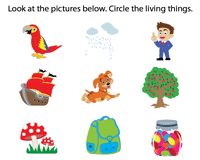 If the answer is 'YES', then circle the pictures; in this identifying the living things worksheet PDF. 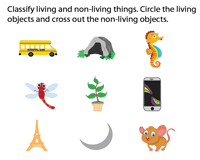 Recognize the pictures, reiterate the knowledge of the characteristic traits of living and non-living things to spot and circle the non-living things from the pictures given in this worksheet. 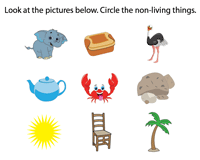 Put on your reasoning caps and decide which of the pictures are of living things and which are not. 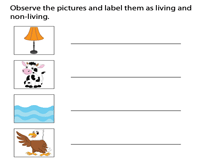 Get kindergarten kids to circle the living things and cross out the non-living things in this worksheet PDF. Rattle your brains to determine which of the words in the word bank suggest living things and which indicate non-living things. Sort and organize the words in appropriate columns. Read the list of words given and deduce, which have life and which don't and label them as living or non-living. 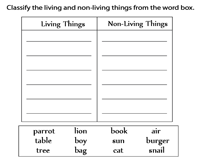 Reiterate the concept for Grade 1 kids, with this living and non-living things classification worksheet. Included in this worksheet are factual statements that require a TRUE/FALSE response. A quick and efficient way for second grade kids to reinforce knowledge of the attributes of living and non-living things. 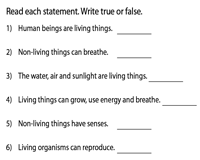 This living and non-living thing - fill in the blanks activity serves best as a comprehension tester for 1st grade and 2nd grade children. 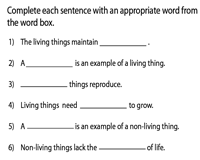 Read and complete the statements using apt words from the word box. Snip the picture boxes and quickly sort them into living and non-living things. 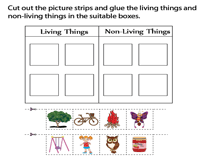 Glue the boxes onto the spaces provided in the classification table to complete this cut and paste activity worksheet.